MAN double decker with ‘Wir finden, auf die Groesse kommt es doch an’ expression. Scania prototype double decker at the Prenzlauer Berg terminus of service 200. 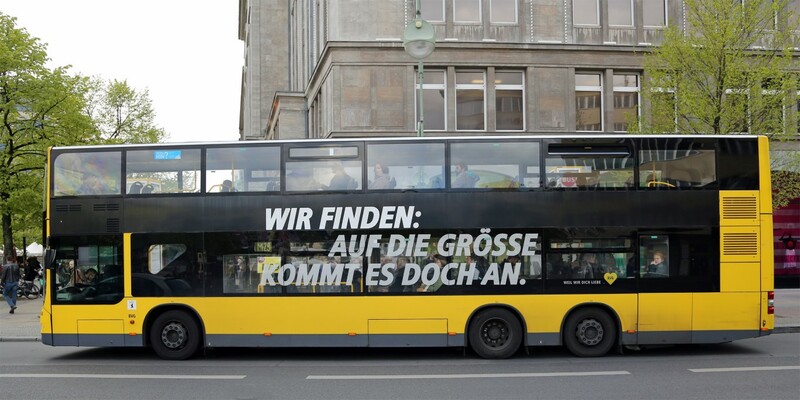 There is a rather tongue in cheek promotional campaign on many of Berlin’s buses at the moment, particularly the large batch of Scania Citywide articulated buses delivered to BVG over the last year or so. It takes the form of up to three line expressions in white block capitals applied to the window line. Some do just point out the importance of the bus to Berlin but others say things like ‘longer than a Kreuzberg night’, Kreuzberg being the centre of Berlin’s alternative scene, or advise people from a certain south German state that the bus can take them to the airport. 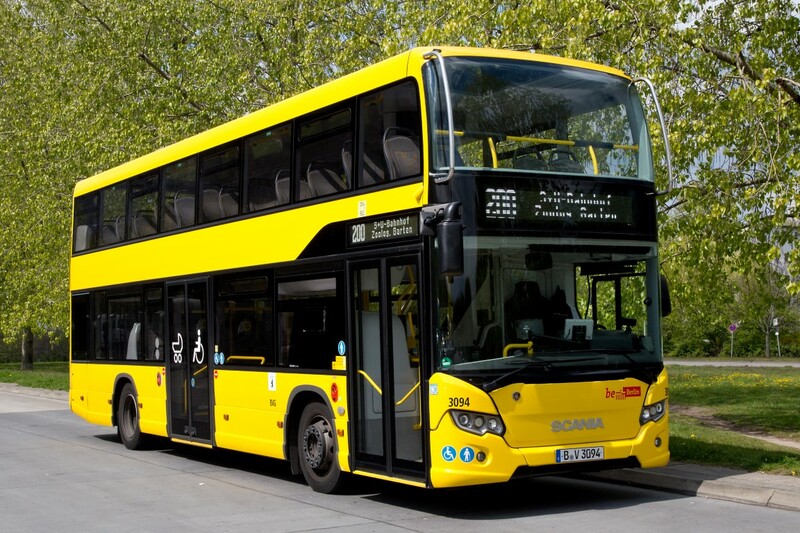 One of the electric buses simply says ‘Gelb stinkt nicht,’ basically the yellow bus doesn’t smell! One expression on the side of an MAN double-decker particularly caught my eye: ‘Wir finden, auf die Groesse kommt es doch an’ which suggests they have established that it really is size that matters. Underneath the surface tongue in cheek, there is however reality in that BVG has found the Scania and VDL two axle double deckers with a single staircase and two doors too small and too slow loading/unloading for many of its routes. A ride on the Scania showed it to be a very competent bus, very UK in feel although the single forward ascending staircase did lead to congestion at stops on the cross city centre 200 service where significant passenger exchange took place. On both the 200 and the related 100 service, which between them take in many of the city’s sights, it appears the interests of reducing dwell time at stops has resulted in many journeys being worked by the Scania articulated single deckers. Whilst speeding up many journeys, it does mean sightseers possibly having to wait several departures until a double-decker arrives!